In the past three years Creatures has been working to build a connection between nature and children. As time goes on it has become clear that the whole family needs to be involved in making this connection. I am so happy to say that we will be expanding our focus to the whole family now! First we start with the Mothers. Often after childbirth it can be incredibly hard to reconnect with yourself. The feeling of disunity between our mind, body and spirit makes it hard to be our best. It can often lead us to feel lost, anxious and impatient. Share our stories in a safe loving space. Walk through the forest as a group, making sure to appreciate the quiet and peace around us. 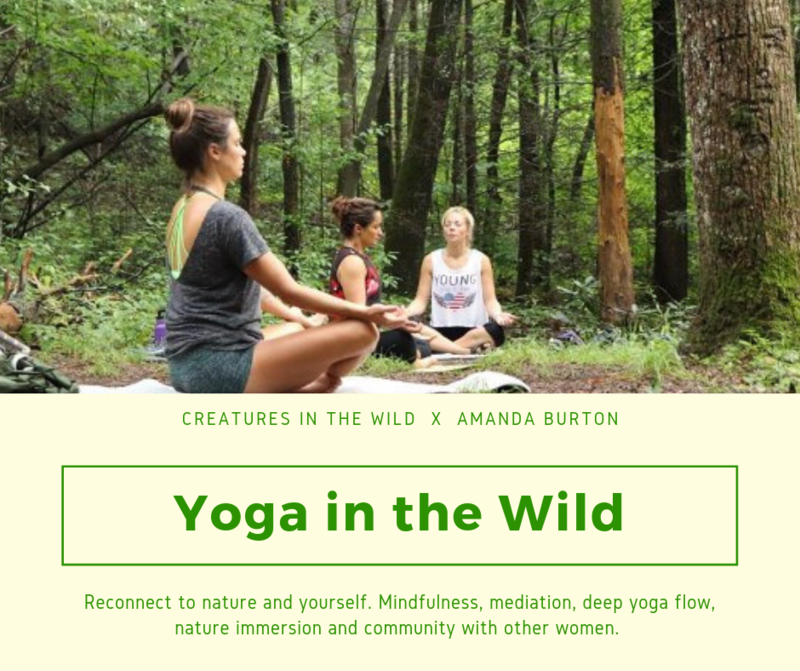 Participate in a deep meaningful yoga flow lead by the wise Amanda Burton. In the forest, on the earth where we can truly connect to Mother Nature and our own bodies. Practice meditation and mindfulness tactics that often are hard to do with kiddos around. Learn from one another and create a strong community filled with divine feminine energy. Leading the yoga is long time friend of Creatures Amanda Burton! Amanda is one of the wisest humans that has ever graced our forest and we cannot wait to learn from her. On top of being a yoga teacher she has piles of certifications and degrees in inclusive education, and owns her own business Tranquil Ways that helps people with traumatic brain injuries. What is Infinite Light Yoga? Infinite Light Yoga (ILY) is based on the teaching methodologies of Kripalu Yoga, which originated from the personal practice of Kundalini Master Swami Kripalvanandji (Swami Kripalu). Infinite Light Yoga is an experiential form of yoga which blends the practice of classical yoga with mindful awareness. Each Infinite Light Yoga class provides the student with a truly unique experience, all classes include the physical postures, meditation, breathing, and the relaxation techniques of classical yoga. Please dress appropriate for the weather and activity. Bring a yoga mat, towel, water and bug spray. We will have natural bug repellents working while we are in class, but they really aren’t bad in the space will be using. Any spray with Lemon Eucalyptus works. Please refrain from using DEET for this class. It does not work for ticks and bothers many people. TO SIGN UP: Please fill out the form below and bring $12 in cash to the class. Let us know if you cannot make it!